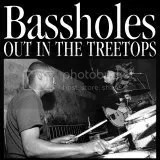 I don’t quite know why the Bassholes occupy such a tender place in my heart. Only the Cheater Slicks consistently rival their ability to take garage rock and pervert it into something entirely their own. I love the Nuggets, Pebbles and Killed by Death comps, but most of it draws from the same well. The Bassholes are a stripped-down reduction of rock and roll, blues and punk like many other bands in the same vein, but their version is so much more eccentric than the rest. I always wondered why John Fahey reissued their Blue Roots album alongside Derek Bailey, Cecil Taylor and Charlie Feathers, but repeated listens convinced me that they were innovators who channeled their roots into new, exciting directions. Don Howland is the main dude and his previous band, The Gibson Brothers, released some great albums on Homestead Records, but they were to focused on the canon. The Bassholes generally break punk and blues down to a minimal pound and wail that embodies all that is raw and immediate about punk rock. This double 7-inch includes covers of The Who’s “Tattoo” and The Stooges’ “Raw Power” and both are mangled beyind recognition. The others are originals, but one reminds me of an unlikely hallucination of Joy Division recording for In the Red or Crypt records.